OK OK. So yes, we can all agree that Episode II was a little...well, it was something. BUT, we can all also agree on one thing: that battle scene at the end was absolutely amazing. C’mon, Obi-Wan and Anakin and Padme are all blasting and fighting their way across Geonosis when, all of a sudden, here comes this awesome stormtrooper….we mean Clone Army battalion in a million dropships to come save the day against the Separatist forces! There’s no denying that was a truly epic battle scene. And now, you can embody the coolness of the Clone Troopers as they invaded the scene and took down that intimidating droid army through all manners of military prowess. In this Adult Clone Trooper Deluxe - Episode II Costume, your visibility may be slightly limited beneath your helmet, and it seems laser fire can still get through your battle armor, and that’s to say nothing of your own shooting accuracy….but c’mon, you’ll look so cool! You can even hold your fingers to your lips and pretend to radio into to Master Yoda for new orders, or get your buddy to go as Mace Windu, and you can both direct troop movement from the field of battle. No kidding. You can actually fight alongside the Jedi! That sounds pretty nifty to us; it’s actually our lifelong dream. 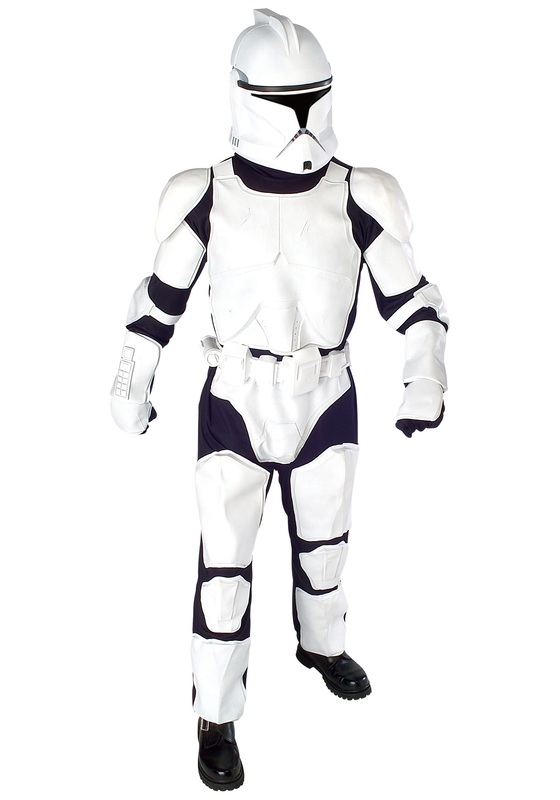 And this great Star Wars costume, which comes with a black jumpsuit with molded rubber armor and a two piece Clone Trooper mask, will help you fit right in with any large scale space battles, or even just your favorite local convention. I work at a school. The kids have a great time see a storm trooper go down the hallway. Thanks!